Assurex Health, a wholly-owned subsidiary of Myriad Genetics, said today its GeneSight genetic test will be studied in veterans diagnosed with major depressive disorder (MDD) through a partnership with the U.S. Department of Veterans Affairs. GeneSight will be evaluated in the PRIME Care (PRecision Medicine In MEntal Health Care) study, a randomized clinical trial designed to show the effectiveness of providing veterans suffering from depression, and their providers, the results of pharmacogenomic testing for psychotropic medications via GeneSight (NCT03170362). The study is designed to show whether and how patients and providers use genetic test results given to them at the time an antidepressant is to be initiated to treat MDD, and whether use of the test results improves patient outcomes. According to the VA, approximately 20% of the 2.6 million veterans who deployed to Iraq or Afghanistan as part of the nation’s War on Terror returned with MDD or a related mental health condition. Suicide rates for veterans are twice that of the general U.S. population. The VA has committed $12 million to fund PRIME Care, which is set to enroll 2,000 patients with MDD and include 250 healthcare providers at 21 VA medical centers. The study is expected to be completed in 2021. “Through this study, we hope to learn if there is an association between the GeneSight test and more effective treatment for Veterans suffering from major depressive disorder, a condition which affects many veterans,” said David Oslin, M.D., principal investigator and chief of behavioral health at the Corporal Michael J. Crescenz VA Medical Center in Philadelphia. GeneSight uses a proprietary algorithm to analyze 12 different genes to weigh their combined influence on patient response to more than 55 psychotropic medications. GeneSight testing is designed to guide clinician prescribing by placing each medication into one of three color-coded categories: “Use as Directed” in green, “Moderate Gene-Drug Interaction” in yellow, or “Significant Gene-Drug Interaction” in red. The test is based on combinatorial pharmacogenomics (CPGx®) technology, which is designed to analyze variations and combinations of a person’s genes along with FDA-approved medications for behavioral health conditions and chronic pain. 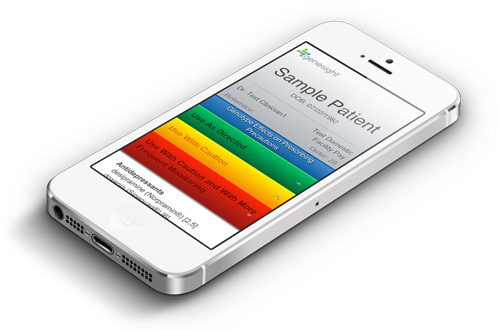 More than 19,000 healthcare professionals have used GeneSight with over 500,000 patients. The test typically costs $330 or less: “We promise that if your cost could be more than $330, we’ll call you before we process your test,” Assurex states on GeneSight’s website. Myriad has cited peer-reviewed, published studies that have associated GeneSight with favorable clinical benefits and significant healthcare cost savings. For example, a prospective cohort study of 165 patients with a primary diagnosis of MDD compared 8 weeks of treatment guided by GeneSight to unguided treatment as usual (TAU). Patients treated with GeneSight showed a 70% greater improvement in depressive symptoms compared to TAU. In another study, patients tested with GeneSight saved $1,035.60 in total annual medication costs compared to TAU patients. Total annual medication savings were $714.24 (69%) for non-CNS medications and $321.36 (31%) for CNS medications. “We are extremely honored to collaborate with the VA by providing our high quality GeneSight pharmacogenomics test to the PRIME Care study and to support the VA’s mission to care for America's veterans,” added Bryan Dechairo, Ph.D., EVP, clinical development, Myriad Genetics.